Our course starts in New York in the 1940s, but 35,000 years of recorded art history exist before this point. Next week, we will pick after the world wars with Abstract Expressionism and Color Field Painting, and see what happened when New York became the center of the art world. But before we touch down with both feet running, what should we be aware of, what lessons from the past can we take with us? For this first week, there are no readings from the book, but make sure you buy it in time to do next weeks reading assignment. Instead, we start right off with the slideshows introducing some key topics. In the slideshows in unit 1, we pull apart the terms “Abstract”, “Expressionism” and “Color Field” and trace them through the timeline of art history to see where they come from. 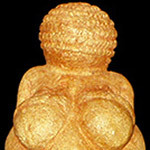 We first look at a very few select pieces of work, from as old as the Venus figurine from Hohle Fels, made of Mammoth Ivory, up to a couple American works from 1950. Stretching them into a timeline, we discuss the spectrum from realism to abstraction, and discover realism encompasses a relatively small part of the history of art. Next, we examine what factors cause artists to return to abstraction in the 1800s. I introduce the term “artistic crisis” here, which is something we are going to see several times in this course. Very broadly, this refers to an external factor that causes artists to feel that the way art has been made up to that point is no longer adequate, and a new way of making art is needed. This can be brought about through external events such as natural disasters or wars, it can be caused by new technological advances, and it can also come about when new philosophical ideas are introduced into public thought. Before finding out the answer in the slideshow, do you have any guesses as to what happened between 1800 and 1900 that would cause artists to return to abstraction? We then start to ask a big question that will come up again in this course, “Why when they can paint pretty pictures, would artists also paint disturbing ones?” We also look at the difference between “formalism” and “expressionism” along the path of understanding of what “expressionism” means. Keep in mind though, that we will find both expressionism and formalism in next weeks artworks. The reading this week is a bit of philosophy. The writing is a little hard to get through, but don’t worry, they wont all be this dense or philosophical. The main point in the article is for Sartre to defend “existentialism”, the philosophical movement that he was part of. We’re reading this because the ideas presented tie directly into the ideas that our artists next week are struggling with. And in the discussion board this week, you have a chance to apply what you find in this reading to some of the artworks from the slideshows. This weeks unit assessment has two parts. The first questions focus on vocabulary from the slideshows: figurative, representational and non-representational abstraction, expressionism, formalism and color field painting. The last three questions focus on Sartre. Remember, use this as a learning experience, you can retake the test as much as you’d like. And please tell me of any technical problems you encounter and we’ll try to iron them out this week. The discussion board this week ties the last slideshow, on expressionism, to the readings on Sartre. This is your chance to make some of your own connections between the course materials, remember there are two deadlines for this part of the course. As always, you can post any general questions or comments relating to this weeks material below. Unit 1: Was the first thirty-five thousand years of art really all abstract. Couldn’t that abstract be attempts of realism? Wasn’t art an evolution of tools, materials and knowledge of drawing that lead to realism? It’s a really interesting question Jim. From our point in history it is easy to compare older works to ones that exhibit what we think of as true realism, and to think of it as one continuous passage towards progress. But “progress” is a fairly modern notion that assumes things must improve. The farther we go back in time the harder it is to know the motivation behind the artworks. People have come up with many theories as to the meaning and usage behind places like stonehenge or pieces like the venus figure in this unit. The one thing we have to be careful of is assuming that older works are more simplistic, or ‘primitive’. Possibly they are reflection a worldview where what we think of as a very realistic artwork would appear incomprehensible. The bigger question may be, is what we think of as ‘realistic’ the only form realism can take?